Philly’s favorite comedy duo graduate from cable television to the big screen with Tim & Eric’s Billion Dollar Movie [actual budget around $3 million though you’d never guess it was that high]. The shameless jokesters do their best to find a balance between the lo-tech, unpredictable nature of their 15 minute programs and the fully formed narrative that’s expected from a feature film. The result is a hodgepodge of clever convention-bending, lazy gross-out humor, and inexplicable non sequiturs that alternate between hilarious and just plain strange. 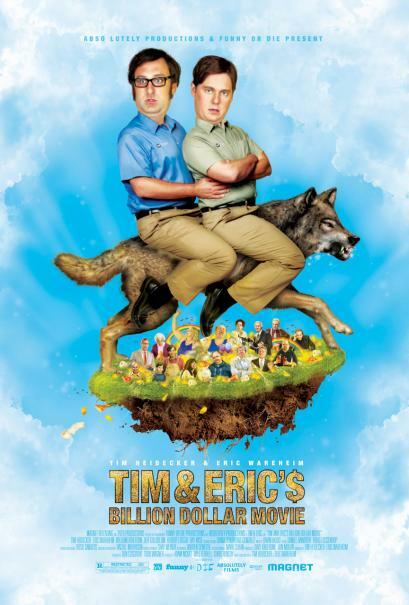 Tim (Tim Heidecker) and Eric (Eric Wareheim) are given a billion dollars by the Schlaaang Corporation, headed by Robert Loggia, which they squander on makeovers. They attempt to revive a decrepit shopping mall in order to pay back their debt; that pretty much sums up the plot. A lot of familiar faces show up in minor roles such as Will Ferrell, John C. Reilly, Will Forte, and Zach Galifianakis, but none of them are particularly funny nor memorable (Ray Wise makes a welcome appearance as a jovial new age cult leader, but the hideousness of what he’s exposed to is best left unsaid [and, for most, unseen]). The film excels when delving into familiar territory (low-budget regional commercial parodies, credit bending, atrocious editing), but viewers who have yet to be exposed to the post-comedy stylings of Tim and Eric are in for a rough ride. At the end of the day, B$M is the most audaciously original work to come out of Hollywood since Tom Green’s Freddy Got Fingered (2001), though originality doesn’t always beget enjoyment. If you find concepts like Reggie’s Used Toilet Paper Outlet humorous then this is the movie for you. Tim & Eric’s Billion Dollar Movie opens today at the Ritz at the Bourse.